This free Easter craft project shows you how to make an adorable country Easter bunny. This bunny is 10 inch (25 cm) in size. 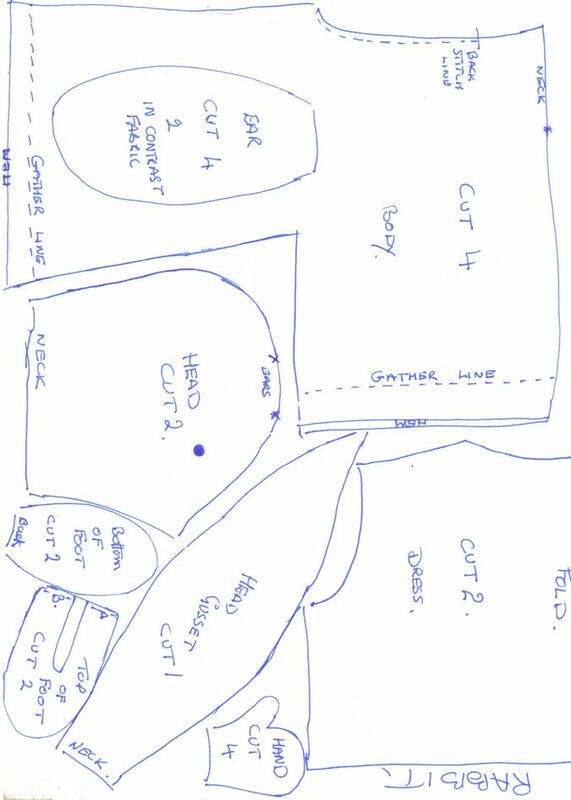 Step 1: Start by cutting out the fabric pieces using the A4 sized pattern below. Step 2: Sew two fronts of body together, then sew the 2 backs together but leave an opening for stuffing. Step 3: Sew across the shoulders leaving a neck area open. Hem the sleeves and the bottom of the legs. Stitch both pieces together (put to one side). Step 4: Ears and Head Make the two ears using one plain color and one contrast color for each ear. Sew the ears together and then turn right side out and iron flat. Pin the ears into place on the head as shown on the pattern. The ears must be in place before you stitch the gusset on as they are part of the seam. Step 5: Stitch the gusset to one side of the head first, beginning at the neck edge. The pointed edge of the gusset should end up at the nose end of the head. Step 6: Once both sides have been attached, sew down from the nose to the neck. You must put your eyes and nose into position before you fill the head with filling. Step 7: Hands: Sew two pieces together and turn right side out and lightly fill. Step 8: Feet Sew seams A and B together of the upper foot together. Sew the top to the bottom, turn right side out and lightly fill. Sew the feet into place using a gather stitch at the bottom of the body. Step 9: Hands and Arms: Sew the filled hands into place with a gather stitch at the end of the arms. Step 10: Body Lightly fill the body with filling and with a gather stitch sew the head into place. Step 11: Dress To make up the dress sew the shoulder seams, then sew around the arm holes with a small hem. Step 12: Slip over the body and gather around the neck. These stitches can be hidden with a ribbon bow.